When looking to find a dentist, we recommend that you visit our office and have your teeth checked for signs of bruxism. If you have not heard of this technical term, it is when people grind or clench their teeth at night or throughout the day when they are not eating. This condition, while seemingly minor, can lead to a cracked or chipped natural or replacement tooth along with enamel erosion, causing sensitive teeth. Those with bruxism typically have teeth that appear flat on the bottom. Naturally, teeth tend to have points where bruxism causes the enamel to wear down. Those with a severe degree of bruxism may start to see their teeth erode upwards as more of the tooth structure begins to wear away. This is often seen in young children who grind their teeth at night. Another common sign is indentations on the tongue. Bruxism can lead to severe erosion of the enamel. When looking to find a dentist, a patient struggling with bruxism needs to select a dentist that treats erosion because of how uncomfortable it can be once the enamel on the teeth wears away. The enamel serves as a protective barrier, ensuring that the dentin underneath is not exposed since dentin is more porous and contains nerve endings. Once the enamel has worn away, anything that one eats or drinks; even air can cause irritation. If the enamel only wears away slightly, we can use fluoride to help strengthen the teeth or perform a bonding procedure. If, however, much of your enamel has worn away we will need to seal in the dentin and the best way to do so is by placing a dental crown on the tooth. This performs two functions: it prevents anything from touching the tooth in order to protect it and restores the tooth’s appearance. Regardless of how worn down the natural tooth is, a dental crown can typically restore it in both functionality and appearance. Once your teeth are protected and restored, we must move to prevent bruxism from reoccurring since it will also damage your restoration. One of the ways to do so is by providing you with a night guard. These look like a full retainer, but they do not allow the teeth to touch at night, making it impossible to clench your teeth or grind them in your sleep. We also suggest that patients also avoid touching their teeth together during the day. Many people mistakenly believe that their teeth have to touch at all times. This can further the likelihood of the wearing down the enamel on the teeth and begin experiencing jaw pain. Instead, allow for the jaw and teeth to remain in a relaxed state when one is not eating and when one does eat, be careful with chewing. Be purposeful yet gentle. 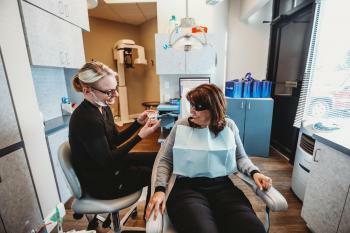 If you need to find a dentist, we recommend giving Highpoint Dental Care a call at (303) 219-2055 so that we can examine your teeth and ensure you are in excellent oral health and if you have bruxism or some other condition, we can recommend a treatment plan.